The haunted home is somewhat of an American small town staple. I’m sure you can think of at least one home in your town that has a “do not enter” reputation. These five homes are deceivingly beautiful; beware of their pasts! 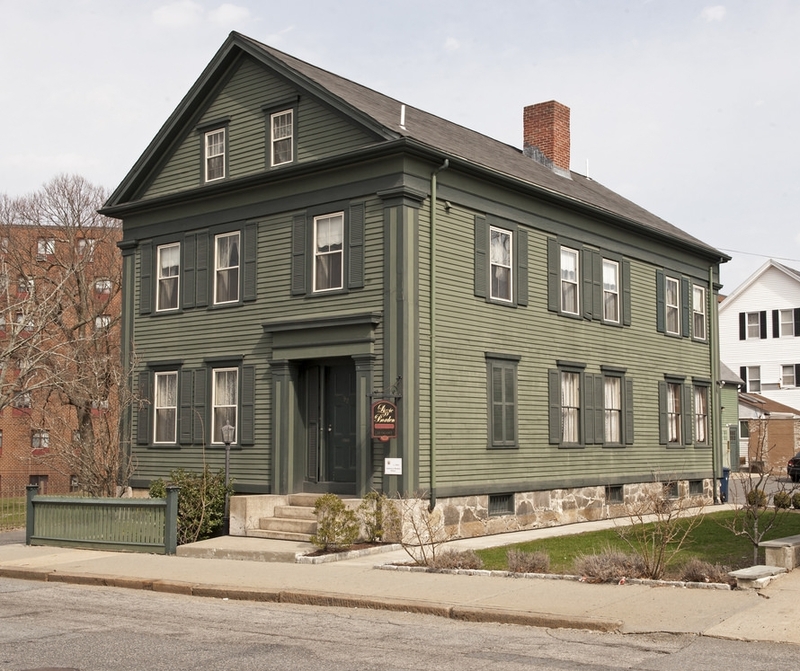 Located in the once thriving mill city of Fall River, this modest Greek revival home was built in 1845 and is still standing in the form of a B&B today. It also happens to be the site of the murders of Abigail and Andrew Borden, which occurred on the afternoon of August 4th, 1882. If you are unfamiliar with the story, there’s an old children’s rhyme that summarizes it graphically. Lizzie Borden was acquitted of the crime due to insufficient evidence but popular belief is that she got away with it. Lizzie Borden took an axe, gave her mother 40 whacks, when she saw what she had done, she gave her father 41. The B&B has maintained its original finishes, décor, and refurbished furniture and has been adorned with photographs and crime scene photos of the murder. It is said to be haunted with the sounds of footsteps, banging doors, and even a women wearing Victorian clothing. You can book a room in the Borden murder suite to see for yourself; although this has become such a popular destination that you have to book months-years in advance! Lizzie Borden House: Andrew Borden's "Murder Sofa"
Lizzie Borden House: The dining room is said to have acted as the autopsy room. Ms. Borden also had a summer home in Swansea, MA that she visited often after the acquittal. Hey, even alleged murderers need to summer! This was my hometown haunt; I grew up a few streets away from her summer home and may or may not have sung that children’s rhyme one too many times while skipping by. This brick and granite lighthouse, built in 1875, is rumored to be haunted by the female spirit of an early lighthouse keeper’s wife. It is said that he pushed her down the stairs, resulting in her eventual death. Allegedly the spirit, known as “Mad Maggie,” is not a fan of the lighthouses male guests. One might assume she still holds a grudge. Block Island Lighthouse Tower Stairs that "Mad Maggie" fell down. This eccentric Queen Anne Victorian home, located in San Jose, California, is a whopping 24,000 sf mansion full of surprises. 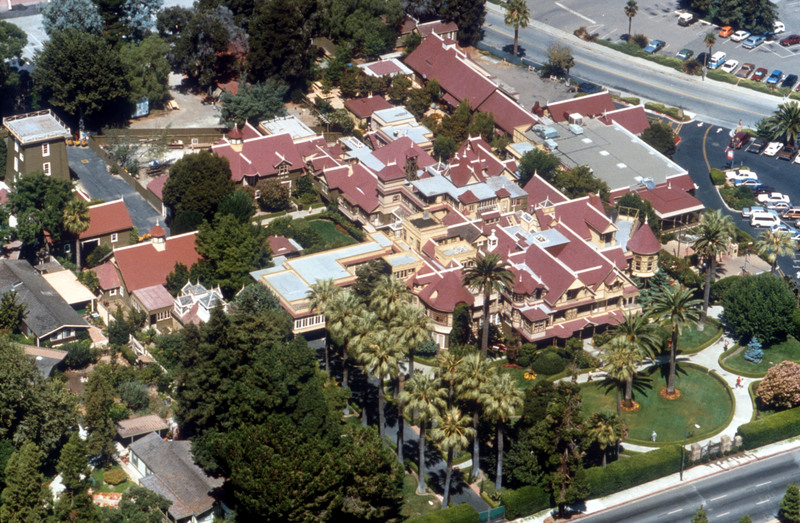 The original owner and architect, Sarah Winchester, was the widow of the firearms mogul William Wirt Winchester of Winchester Repeating Arms Company. Mr. Winchester died from tuberculosis in 1881, leaving Sarah with his substantial inheritance. It is said that after her husband’s death, she was instructed by a medium to build a home for the victims of the companies weapons, and as long as she continued building, she would live. In 1886 she purchased an unfinished farmhouse and began continuously building for the next 38 years straight. It is said that the spirits of the aforementioned victims have been haunting the home since she began construction and continue to do so today. The home boasts approximately 160 rooms, 40 of which were bedrooms so Sarah could sleep in a different room each night to confuse them. There are many other quirks she designed to confuse the spirits including stairs and doors that lead to nowhere, decoy toilets, secret passages, skylights in the floor, 13 paned windows, and much more. The home is open to the public for tours today but beware of the 3rd floor corridors, which claim to be the most popular area for paranormal activity. The White House – Washington, D.C.
Unbeknownst to most, there have been several reposts of paranormal activity at the White House over the years, including sightings of Abraham Lincoln, Abigail Adams, and Andrew Jackson. Lincoln is said to be the most popular guest; Prime Minister Winston Churchill even claimed to have seen his spirit sitting by a fireplace after emerging from an evening bath. This Greek Revival brownstone was built in the 1830’s and has been home to many of New York City’s elite in its days as a single family home. Nestled along a beautiful tree lined street near Washington Square Park, 14 West 10th Street, AKA The House of Death is said to be home to over 22 ghosts. Mark Twain is the residence’s most famous sighting; having lived in the already haunted home from 1900 – 1901. Multiple sightings of Mark Twain claim he can be seen on the first floor near the staircase wearing a white suit. You can still rent one of the 10 apartments at the House of Death today in hopes of a good ol’ celebrity ghost sighting. Whether or not you believe in ghosts or haunted houses, their histories are certainly chilling and their structures magnificent. Does your hometown have any haunted attractions?